Eight of the 14 Big Ten teams have already started, finished or will play in early-season tournaments this week. The festivities began Monday afternoon with Wisconsin in the Maui Invitational, but continue for much of the week as turkey, dressing and cranberry sauce commingles with basketball in far-flung locales. Here’s the third of a three-part breakdown that discusses what each participating Big Ten team faces this week. Capsule: Things were looking relatively good for Illinois as it got off to a 4-0 start… and then the Illini lost to Winthrop at home. 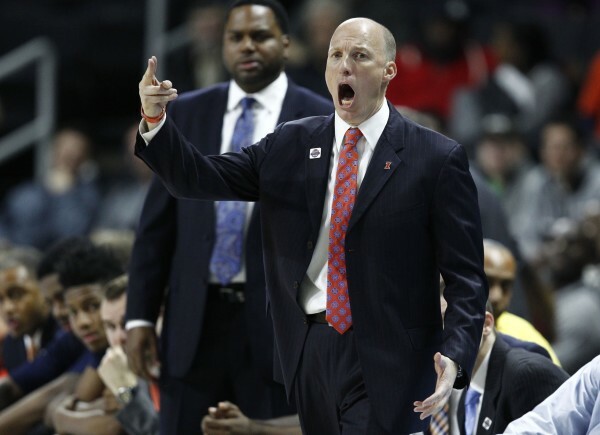 In what might be a make-or-break season for John Groce, a couple of wins against quality teams in the Big Apple would definitely ease some stress. Illinois squares off today against the national leader in creating turnovers and steals when it plays West Virginia. Those same 22 turnovers against Winthrop will end this game quickly. Key Player: Tracy Abrams will be the key here. The sixth -year senior not only needs to break the Mountaineers’ press, but unlike the offensively-challenged Jaylon Tate, he can also be a threat to score. Abrams needs to max out his experience and ability for Illinois to come away with two wins in New York this week. Prediction: The West Virginia game will be an ugly loss, but expect the Illini to respond and beat Temple in the consolation game on Friday. The non-conference portion of the schedule hasn’t been great to the Big Ten so far this season, but Feast Week gave some of the league’s teams positive feelings about the future. Here are five schools that can feel good about themselves after the week that was. Illinois: The Illini have a lot of extra dead weight to shed from their 3-4 start to the season, but anyone who watched their win against UAB and the first 30 minutes against Iowa State saw that this is a different and better team with a full complement of players. Kendrick Nunn looked rusty but he averaged 18.5 PPG in the two games — a healthy Nunn, Leron Black and Jaylon Tate showed the potential that exists here. The knee injury to Mike Thorne, Jr., however, is a real downer. A healthy Peter Jok is huge for Iowa. The junior wing scored 20 points last night as the Hawkeyes pasted Marquette to give the Big Ten a 4-3 lead over the Big East in the Gavitt Tipoff Games. Before the season began, we detailed Jok’s importance to the team’s success, but an injury sustained in the Hawkeyes’ first game of the season put him on the shelf. Sophomore Dom Uhl and freshman Brady Ellingson combined for 38 points on 14-of-18 shooting and eight rebounds in Jok’s absence, but in only 28 minutes of action this season, Jok has accounted for 28 points himself. Nevertheless, Uhl and Ellingson’s production is an encouraging sign for Iowa’s depth, which was a significant question mark entering the season. Rutgers may have found itself a leader. The Scarlet Knights lost a heartbreaker to St. John’s on Thursday when Bishop Daniels’ game-winning three-pointer left his hand just after the clock hit all zeros. But the silver lining in the loss was the continued emergence of freshman Corey Sanders, who played at least 30 minutes for the second straight game and is averaging 4.5 APG on the season. On Rutgers’ last possession yesterday, head coach Eddie Jordan trusted Sanders to call and run the final play that was very close to producing a buzzer-beating victory. Even if Rutgers struggles mightily again this season, Sanders is quickly looking like a key building block for the program’s future. The early signing period ended on Wednesday, and Wisconsin and Rutgers were the two Big Ten programs that failed to land any signees. Every other conference team signed at least one player, and all but Purdue signed two. Rutgers lost its lone commitment — three-star point guard Kwe Parker — in early November when he decided to reopen his recruitment. Wisconsin whiffed on two of its bigger targets, top-100 point guards Xavier Simpson and JaQuori McLaughlin, down the stretch. Neither team has enough space for a large incoming class, but Bo Ryan and Eddie Jordan have work to do before the next signing period in April. Purdue’s backcourt is proving itself. We touched on the Boilermakers’ need for additional backcourt help before the season started, and so far it has delivered. In the team’s first three games, forwards Isaac Haas, Caleb Swanigan, A.J. Hammons and Vince Edwards made a combined total of 41 field goals — the backcourt or Edwards (a wing who does a little of everything) assisted on 20 of those. Meanwhile, incumbent guards Rapheal Davis, Kendall Stephens, Dakota Mathias and freshman Ryan Cline are averaging a combined 40 points per game and are shooting 48 percent from behind the arc. The biggest open question was with UT-Arlington transfer Johnny Hill, who was brought in to be the starting point guard. So far he boasts an 11-to-4 assist-turnover ratio with seven steals, yet another reason why Purdue has won three games by an average of 34.7 points per game. 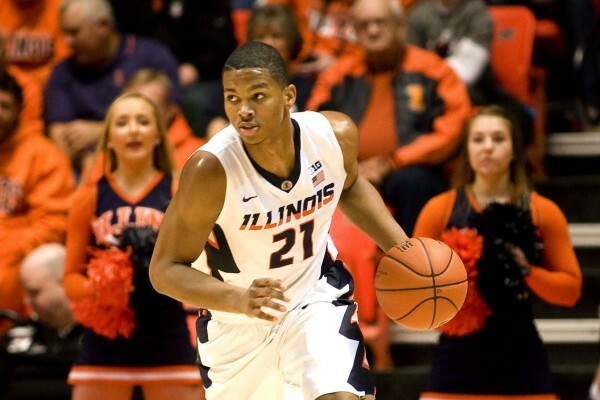 Illinois’ freshmen are surviving trial by fire. 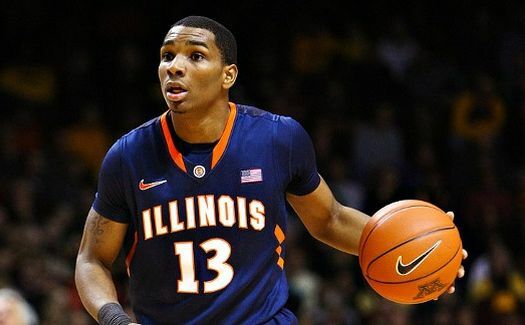 With Jaylon Tate, Kendrick Nunn, Leron Black (who returned to action after missing one game) and Tracy Abrams all sustaining various injuries since the start of the school year, Illinois has needed some mileage from its freshmen, D.J. Williams, Aaron Jordan and Jalen Coleman-Lands. While not perfect to this point, the trio has been productive. Williams started the first two games and only totaled four points, but he had zero turnovers and just one foul. Jordan has averaged 8.0 points per game with an 8-to-1 assist-turnover ratio. Coleman-Lands ranks third on the team in scoring with 12.3 points per game and has averaged 24.3 minutes of action off the bench. He also leads the team in steals (five), three-pointers (nine) and three-point percentage (56 percent). All of this hasn’t been enough to get Illinois more than a single win against North Dakota State, but the experience that the youngsters are getting will be invaluable when conference play starts in January. After a junior season that saw him dip from a first-team all B1G performer to a third-team selection this season, Terran Petteway still has a decision to make about whether or not to declare for the NBA Draft after the season is over. Nebraska is on Spring Break March 22-30, and with him on pace to graduate in May, look for a decision after the break is over. An argument could be made that he probably should have left after last season when his stock was at its highest. But with what the Huskers were returning this season, one can’t blame the wing for wanting to come back and take Nebraska even further. Illinois has a great deal to accomplish in the upcoming Big Ten Tournament, as they are essentially trying to play their way off of the bubble in trying to avoid a second consecutive season in the NIT. The Chicago Tribune’s Shannon Ryan took a look at five keys for the Illini in advance their opening game Thursday against Michigan, and to keep winning in the tournament at large. Some of the things listed included getting more out of sophomore guards Kendrick Nunn and Jaylon Tate, and simply making shots. The Illini have a tough road ahead of them, and may need to upset Wisconsin. A win over Michigan in the second round simple might not be enough. Another looming NBA Draft decision could happen at Indiana, as junior first-team All Big Ten point guard Yogi Ferrell might have a decision to make as well. His father said that Yogi is leaning towards coming back, but some factors that could play a role in whether he does so include getting some size added to the roster in the offseason, and whether or not Tom Crean remains the coach. The Ferrell family remain some of Crean’s biggest supporters, so that’s an added variable to all the drama in Bloomington right now. Right now, the Hoosiers need to concentrate on taking care of Northwestern on Thursday, because losing that one will make their NCAA Tournament hopes faint. It’s been a game of musical chairs at the backup point guard position for Purdue this season. PJ Thompson and Bryson Scott have seemingly fallen in and out of favor with Coach Matt Painter. It was Thompson’s turn on Saturday against Illinois, and the freshman didn’t disappoint. He sparked a rally at the end of the first half with a steal and a basket, and ended things with a crucial three-pointer near the end of the proceedings. Octeus will get most of the minutes from here on out this season, but whether it’s Thompson or Scott that emerges as a starter next season is going to be one of the biggest stories that plays itself out before 2015-16. Minnesota has not had quite the season that it hoped for after finishing with a 6-12 record in conference play. Despite the fact that they’re 61st on KenPom- which is within striking distance of Big Ten bubble squads like Purdue (48), Illinois (53), and Indiana (55)- the Gophers would need a miracle finish to get into the NCAA Tournament. While bad luck played a role, the Gophers really didn’t get the production they needed from their senior class this season. Coming off of the momentum from winning the NIT last year, the senior class just simply didn’t perform many times as they lost multiple close games. Northwestern has gotten off to a decent 10-6 start overall with an extremely young lineup. Vic Law came from Chicago’s famed Catholic League as what Wildcat fans hoped would be the beginning of a beautiful relationship between Chris Collins and the Windy City’s best high school players. Fellow freshman Bryant McIntosh has shined, while Law has struggled to adapt to the physicality of Big Ten basketball. It’s too early to write him off as a bust, but Law needs to produce more than the 2.7 PPG and 4.0 RPG he has contributed in his first three B1G games. While things haven’t been great this season for Michigan, they have something to look forward to on January 24. Consensus top five wing Jaylen Brown will make an official campus visit on that Saturday when the team takes on Wisconsin at the Crisler Center. Brown would obviously be an enormous coup for the Wolverines. The team they have this season is mainly made up of underclassmen. Even if Caris LeVert were to leave early, having Brown to go along with most of the pieces that should return to Ann Arbor could make the 2015-16 Michigan unit one to be reckoned with in the league next season. Hanner Mosquera-Perea suffered a knee injury on Monday in practice, leaving Indiana and their already undersized frontline even smaller. The junior from Columbia is averaging 7.5 PPG and 5 RPG this season in a little under 21 minutes of court time. He had been in Tom Crean’s doghouse for getting into early foul trouble in recent games, and now it looks as though Emmitt Holt and Collin Hartman will get most of his minutes inside for the Hoosiers. Hartman played 23 minutes with Holt logging 13 in their win over Penn State last night, but it’s worth monitoring the situation to see how Indiana survives after going from very little size to no size at all. Frank Kaminsky will be back in the Wisconsin lineup Thursday night when they take on Nebraska in Madison. The senior who leads the team in four major categories (points, rebounds, steals, and blocks), missed the loss against Rutgers after suffering a concussion in the Purdue game last week. The Badgers will still be shorthanded as they will be missing Traveon Jackson due to injury, but with Nebraska playing better with their whole team now healthy, the return of Kaminsky is needed. Illinois faces a critical test when they travel to Evanston to face their in-state rivals tonight. Despite losing Sunday night against Nebraska, their defensive effort was pretty solid. The problem they’re having without Rayvonte Rice is that they simply can’t shoot the ball. Loren Tate of the Champaign News-Gazette broke down just how pedestrian the shooting numbers have been as of late. Two specifics he mentioned were the fact that Nebraska played off of Jaylon Tate, daring him to shoot from deep. He also mentioned the fact that Nnanna Egwu simply can’t score in the post when he isn’t facing up. If Aaron Cosby and/or Ahmad Starks can break out of their collective year-round slumps, then things might change. Otherwise this team will be buried before Rice returns to the lineup. As the ACC and the Big Ten teams get together on the hardwood this week, the ACC and Big Ten microsites (Brendan Brody and Lathan Wells, specifically) have also decided to team up to break down some of the key questions for a few of the games. What follows is a look at tonight’s Top 25 battle between two unbeatens: the 6-0 Illini and the 7-0 Hurricanes. Brendan Brody: After a mediocre 17-16 mark last year, Miami is back in the Top 25 with Big 12 transfers Angel Rodriguez (Kansas State) and Sheldon McClellan (Texas) deservedly getting most of the credit. Let’s talk about how other key players like Tonyi Jekiri and Manu Lecomte have also had an impact, and how they will affect the outcome of this game. Lathan Wells: Lecomte looks much more comfortable playing off the ball and allowing Rodriguez to run the show this season. The result is enormously efficient basketball, as he is averaging 13.3 PPG and shooting 56.7 percent from the field. If Rodriguez and McClellan are being stifled, he offers a third excellent perimeter scoring option. Jekiri, to his credit, has blossomed into a force around the basket, averaging just shy of 11 rebounds and 2.6 blocks per game. 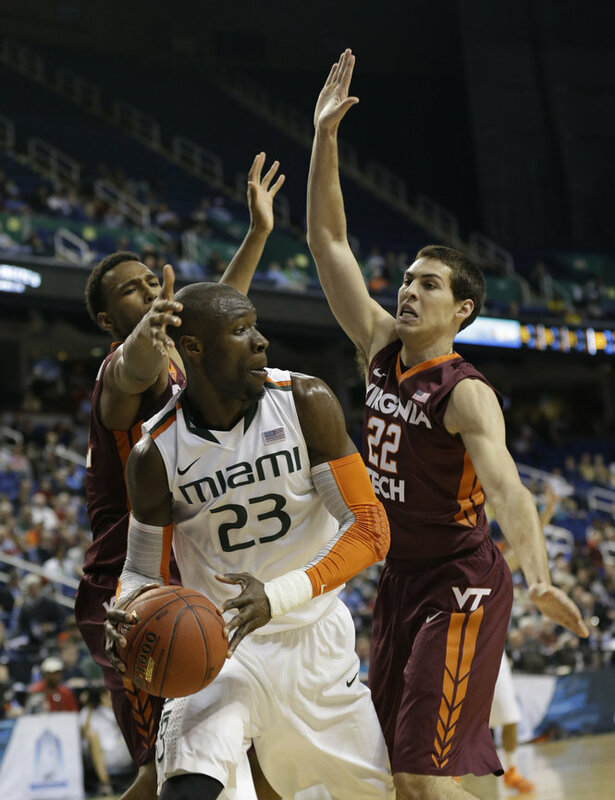 For a team relying on consistent guard and perimeter play, he has helped to keep the Hurricanes balanced. While it’s true Rodriguez and McClellan are driving Miami’s hot start, don’t be surprised if Lecomte comes up with a few key baskets or if Jekiri helps keep Miami on the plus-side of the rebounding margin. Illinois hangs its hat on defense first, but the Illini rank fifth in the country in averaging 90 points per game. How will they handle a lower scoring contest if Miami is able to slow things down? In the first two months of the B1G season, many freshman have debuted to largely mixed results. Coming into the season, there were 13 freshmen in the league who made the top 100 of the recruiting services consensus index, and some have had a greater impact than others so far. What follows is the five best of the bunch as we head into league play starting this afternoon. Noah Vonleh (right) has been the best freshman in the B1G so far this season. 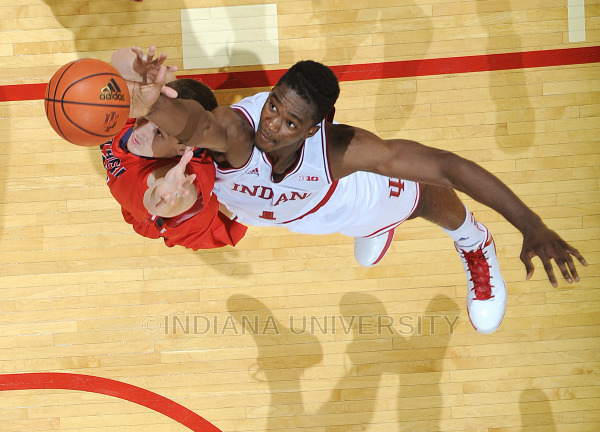 Noah Vonleh, Indiana (12.0 PPG, 9.5 RPG, 1.1 SPG, 56.3% FG). Vonleh has been the best Big Ten freshman by far in the non-conference season. He’s leading the conference in rebounding, and is getting it done on both the offensive and defensive backboards. He’s especially good at grabbing defensive rebounds, doing so at a rate of 29.3 percent (good for eighth in the country). Indiana has struggled to keep him involved in the offense, but he’s shooting a high percentage despite getting many of his points from put backs and trips to the free throw line. If Indiana wants to get off of the bubble and ensure another NCAA Tournament appearance, Vonleh has to be a bigger part of the offense. Keith Appling has been off to a hot start this season for Michigan State, but make no mistake the heart of the Spartans’ offense is Gary Harris. Tom Izzo wants him to take at least 15 shots a game. If Harris is knocking down shots from the perimeter, it will open up more of the floor for Michigan State specifically Adreian Payne. Harris was voted the preseason Big Ten Player of the Year and will be under constant pressure to perform at a high level. A big question mark heading into this season for Ohio State was whether Amir Williams could finally step up and become an offensive threat on the post. So far, Williams has performed well. He is averaging 9.5 points, 6.8 rebounds, and 2.3 blocks a game. Last year, the Buckeyes never really had a true post threat as Evan Ravenel saw time and even DeShaun Thomas would play some five. It will be crucial to the Buckeyes’ success that Williams produces down low, especially against Big Ten foes. Losing 2014 point guard prospect Quentin Snider was a big blow to John Groce and his Illinois program. Snider was deemed the point guard of the future once Tracy Abrams last. However, Illinois may have found their future point guard internally already. Jaylon Tate has played extremely well in backing up Abrams this season. Tate actually leads the conference in assist to turnover ratio. The Chicago product may have gotten lost in the shuffle next year, with Oregon State transfer Ahmad Starks becoming eligible and Snider was also suppose to be on campus. Now, Tate looks like the key guy to run Groce’s offense for future seasons. It’s a given that AJ Hammons is a valuable piece to Purdue. So its understandable why Matt Painter wants his team to feed Hammons more on the post. Purdue has been struggling with their three-point shooting, making Hammons low-post scoring even more crucial. Purdue heads to Anaheim to take on Oklahoma State in the Old Spice classic next week. Hammons will need to have one of his better scoring games to keep Purdue competitive in this one. Michigan handled Long Beach State easily in the first round of the Puerto Rico Tip-Off in Thursday. But the bigger news for Michigan may have been that their main competition in Puerto Rico lost. Both Georgetown and VCU fell in their first games, opening up the bracket significantly for the Wolverines. Michigan will take on Florida State and a win would set up a date against either Charlotte or Northeastern. This may not have been the path Michigan envisioned, but the road to a tournament championship certainly seems brighter.